The development of geological and chemical knowledge during the early 1800s set the stage for the theory that cancer was a result of the environment. The perfection of a very early form of mineral chemistry or geochemical research came to be during this time. As scientists began incorporating chemistry and acid-alkaline behavior into their philosophy due to experiments on the minerals they found, such as limestone, physicians naturally tried to relate these findings to the possible causes for the miasma theorized to cause disease. This argument actually began a consequence of the popular alkaline theory for disease made popular during the 18th century by Hermann Boerhaave and John Baptiste von Helmont, when alkalinity was claimed to be the cause for many illnesses. Once the American Revolutionary War was over in 1783 and the treaty signed in 1787, scientists in the United States began taking a closer look at the increasingly popular geological version of the alkaline theory for disease. Such efforts led to the development of the first natural philosophy based theories for diseases linked to features common to just the American soil. The possibility that disease was a result of our ability or inability to adapt to nature made Lamarckian theory one of the most important underlying scientific theories out there in medicine due to its applications to health and disease in general. The healthiness and unhealthiness of mineral springs, their relationship to the local substratum made up of limestone, and the karst topography that defined such regions considered more healthy, made it easy for physicians who were even superficially trained as naturalists to be able to define adequate living environments. Our understanding of mineral chemistry enabled theories to be formed in which the ability of rocks to form gas such as carbon dioxide, hydrogen sulfide, and methane provided a scenario for miasma to develop. Whereas in the 1600s and 1700s, a theoretical substance known as phlogiston was used to explain diseases, during the early 1800s the nature of this invisible, theoretical phlogiston was better known, and its reasoning attached to the pathogenic nature of calcium and lime rich, alkaline rocks and land masses. 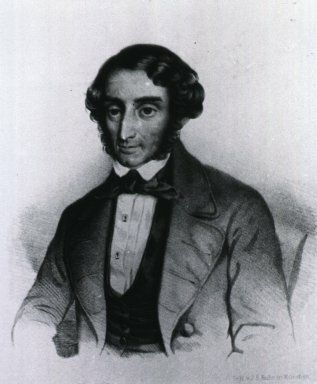 In contrast to Priestley’s recently developed theory for Oxygen, there was the septon theory created by Samuel Mitchell of New York, which he used to define how the nitrogen- or ammonia-enriched effluvium of rotten places and decaying organic matter could produce fevers and dysentery. This theory focused on nitrogen components, the stench and burning of ammonia vapours and the stink of decaying organic products were linked to the theoretical septon. Samuel Mitchell invented this concept of septon as a cause for disease in order to link sepsis to certain forms of diarrhea and other ailments around 1795-1800. Were it not for the imagination physicians needed to maintain some stability and understanding of their profession and its philosophy, it would have ceased evolving fifty or 100 years earlier. Science becomes inefficient if changes are not made in the continuously evolving sets of errors that science taught in the 1800s, errors that erupted due to the betterment of even worse errors from the past. Errors that are better, but still misguided in most places, replaced by very accurate observations and conclusions in just a very few others. Not all “Cancer” cases were actually cancer in the early 1800s, and the earlier the documentation, the less likely it was true cancer. Only three to five of the above photographs actually depict a possible cancer as we define it today, depending upon diagnoses. Aside from the two cases of eye cancer and a possible chest cancer (top center), we see Rheumatoid-induced geniculoarthritis, “Rodent Cancer” (periorbital ulceration), Aneurysmal Varix and an undefinable skin growth, swelling or ulcer also sometimes interpreted as cancer. Whatever the theory, phlogiston, septon and a number of other natural features of nature were often linked to cancer. Until the true nature of cancer could finally be documented some time between 1925 and 1950, we could not possibly ever develop a theory for cancer or means of treating cancer that would be truly effective and the best that is out there. Treating cancer is like treating a wart. Cancer is due to multiple events and causes that vary from place to place, cancer type to cancer location. Warts are due mostly to just a virus. Yet the causes for each and their treatment underwent nearly identical periods of summations, errors, misguided treatment theories, unhealthy means for eliminating, and at times very unhealthy results. Both were mid-growths that had to be stopped and removed from the body. Warts were often removed for cosmetic and sometimes functional purposes, like the annoying plantar’s art grown deeply into a farmer’s foot. But cancer did not have its limits so much in the clinical setting. A cancer of the foot would continue to grow, not reach its dead end in maximum size like the plantar’s wart did. Cancer had its way of spreading about the body, so if you thought that you could eliminate it by simply removing it from the human flesh by use of a very destructive acid wash, you would later be surprised when it re-erupted again in another form several organs away, internally instead of externally, and this time more deadly than the previous form. How we evolved the treatments we had for cancer is a rather unusual story that focuses on the geographical theories for disease, in particular some offshoots of the older alkaline theory prevailing at the end of the Colonial period in American history, decades after the alkaline theory for disease came to be used as a substitute for the humoral imbalance theory. With the humoural imbalance theory, there were four “humours” making their way through the body that had to be kept intact and in a healthy ration to one another, all sufficiently active and meandering about the flesh. With the alkaline theory, it was proposed that our consumption of products from nature, in the form of air, food, water, had these effects upon our chemistry within, which once it became imbalanced in terms of its alkalinity, caused diseases to happen. This was a by-product of the late 17th century writers like Hermann Boerhaave, Johannes van Helmont and ultimately George Ernst Stahl and Friedrich Hoffman. By the 1720s, the last two developed theories that prevailed in American medical practice traditions, enabling discoverers of the rocks and soils of the earth to relate their findings to health. A natural progression of the theory for disease ensued as we stopped blaming the body and mostly its temperament, constitution and/or inheritance for the alkalinity linked to diseases, and pointed our finger specifically at the environment as the cause for our sickness. This philosophy came quickly to a head following the Revolutionary War in what became the United States. Foreign physicians serving the patriotic side of this battle taught U.S. physicians their side of the environmental theory for disease. So with this, the philosophy and decades of scientific and philosophical reasoning needed to the environmental theory for cancer generated by Alfred Haviland to develop. All of this began due to the simple differences between a bedrock that first drew our attention to it due to its fossils, and all the other rocks that tended to lack these objects–limestone. In 1799, limestone was considered to prevent certain diseases (Samuel Mitchell, of the NY Regents medical school in particular) and soon after serve as a stimulant for others once the various alkali were became associated with it. 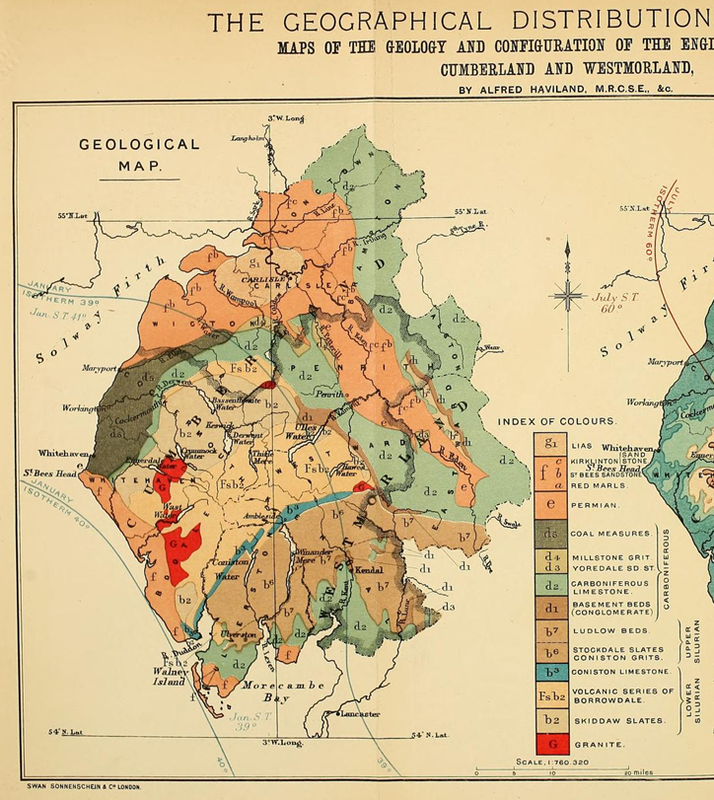 By the 1830s, geologists speculated that soil was responsible for certain diseases, and could be the source for miasma either physically as its storage chamber or chemically as its most likely cause through effervescence and inducing excelled rates of breakdown or decay. Soil represented to natural philosophers that balance in nature they were in search of. It contained the carbon needed for certain vital processes to begin, along with the water, air and even heat or electric spark needed for life to form, along with the ingredients needed to produce disease. Everyone knew that soil was the link between abiotic rocks and biotic plants and animals. It established that transition layer needed for plant seeds to take form on cliff faces, and was considered capable of making us who were are we well in terms of health and the foods we grew on farms. If soil could control our food, water and the way that we lived, it most certainly could also control our quality of life and whether or not we were healthy or ill. Such a philosophy was a natural consequence of what scientists learned and believed in between 1800 and 1830. Limestone was just another very small piece of the puzzle of nature being handed to physicians, just enough to give them the logic and viewpoints needed to link disease to bad air (malaria with swamp gas), water (alkaline or not), or rocks and soil (alkaline or not) for the next fifty years. Notice there is everything but fire list here, once again, the last of the four humours which by now have been reconstituted and redefined. In the very early 1800s, the “cancer” understood by physicians mostly referred to superficial problems and physical deformities that we watched develop. They were mostly external forms bodily change. By 1840, physicians knew enough about anatomy, physiology, organs and tissues to distinguish the true cancer in the above cases from the others (vitiligo, acromegaly or rheumatoid, hydrocephaly, alopecia, scrofula). To the lay person this was not the case, which also included many “alternative healers.” Thus the ongoing debate between old fashioned cancer cures like the Essaic Remedy, which ate away all flesh along with with the “tumor”, and today’s definition for a true cancer cure. More than 50 years later, with the acceptance of the natural theories for disease broadly accepted, and much evidence posted for the alkaline theories of disease relative to nature’s environment, Haviland’s work on the geography of cancer was published. When we review of Haviland’s work, we are left wondering ‘how could someone be so far off on the etiology for cancer so defined?’ A very important phase in the development of Haviland’s work came when the alkaline theory was transformed into a reliance on natural principles in nature other than just having to deal with alkalinity. In early American and British medical history, much of this theory was being built, in bits and pieces by various authors publishing their on incredulous theories based on simple observations. Standign on the side, outside the world of anglican writers and publishers, were the germanic and prussian thinkers who constructed their notion of disease by defining nature as an organism, and the nature of land as landschaft. The landschaft was a combination of physical, chemical, and other attributes to a place on which we live, and how the sum of these components make us able to reside in that place, or diseases susceptible people. With time, this focused mostly on atmosphere (climate, weather, temperature, moisture or humidity), latitude (climate and seasonal wind patterns) and ground. The concept linking all of these parts of the landschaft together was the ever existent, repeatedly stated theoretical substance that replaced the phlogiston causing diseases in the body–miasma. 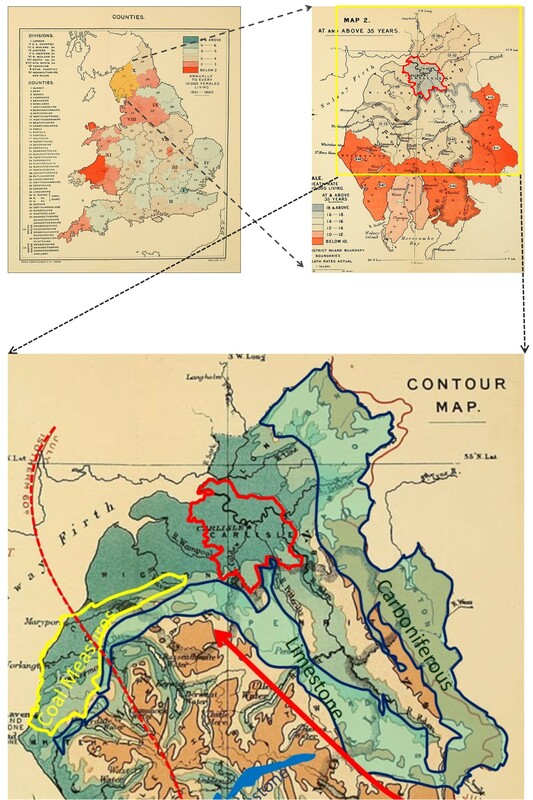 Before reviewing Haviland’s map on Cancer in Great Britain, it helps to see this theory of landschaft related miasma theory for disease in detail, for which reason it is reviewed. The background information for this theory, the basis of this query of disease and cancer in particular, is what gave us the geological study of disease we often hear bits and pieces about by writers of mid-1800s. This theory helps to put the American geographers’ work on diseases in context with the scientific knowledge beliefs for the time, after which we can see how such a mistake in logic and reason, based on contemporary background knowledge and observations, could have existed back then. How we view the relationships of the events in nature to each other and to ourselves in the end defines how we review our health, diseases and their reasons for being. The following quotes/translations are pulled from a section of a German book on medicine dated 1847 entitled Handbuch der medicinischen Klinik. . . by Dr. Carl Friedrich Canstatt. With this translation we see how the German interpretation of natural philosophy explains how such a tradition developed through the 1850s and into the 1860s and 1870s. The reasons for focusing on German philosophy are as follows. First, this European tradition resulted in the first mapping of diseases as regionally distributed global phenomena dependent upon latitude, longitude, the amount and intensity of heat and solar activity. , along with temperatures and humidity, for example the very first world map of disease produced by Heinrich Berghaus, followed by the second and third such maps produced by Adolph Muhry of the German professional community, and Alexander Keith Johnston of the Anglican community. Second, unlike British scientists and philosophers, German scientists and philosophers had the ability to merge words with different meanings into a single concept. These compounded words often resulted in concepts such as Landschaft-the gestalt of land and its form, meaning and use, Excretionsstoffe — (stuff that is excreted – – fill in the blanks), “der Humoral und Solidarpathologie” — leftovers of the humoural and solids theory popular as back in the 1780s, 1790s and even early 1800s, Blutbestandtheile – blood’s natural form or substance interpreted for the time, Krankheitsprocesse – a natural history take on pathogenesis, and Individualitätskrankheiten — those very unique one-of-a-kind cases that only one or a few people can ever have due to their unique heritage and psychology. These German concepts respected the microcosm as much as the macrocosm of earth and disease, a philosophical concept sometimes lacking from the mostly microcosmic approach taken by other western European scientists trying to better understand human health and disease. In the following pages from Canstatt’s work, we find the evidence for such logic now reaching a peak in certain professional settings. In recent years, a great majority of physicians have together claimed that there is special pathology people suffer comprised of ontological entities or beings that together they have assigned the special name Ontologisten. This widespread following recognizes the main feature of such an entity to be a particular set of symptoms or Symptomatic groupings, a complex of external signs and symptoms that are related to one another and that together are considered indicators of the construct of the disease, of the disease entity or true inner reason for why the disease exists, and something to concern themselves with, something for which they would be considered reckless if they did not stringently investigate any physiological relationship they had with a sickness phenomena, in its internal and external characters, instead of simply indulging in the empirical knowledge of the disease, and with the final goal of developing a treatment against this particular disease, a widely adoptable plan of salvation, an entire course of action to pursue as a physician. Through the knowledge of the causes which have brought about the current as pathological changes, we gain an understanding of the whole process. Due to the diversity of causal factors influencing the variety of the effects of these changes in the organic matter, these changes are not limited. I have already remarked that for the study of the origin of each form of the disease, there is a genetic side of importance of knowledge that must be pursued regarding how the two complement each other. I draw special attention to this form of etiology everywhere in this work. 1) natural, always acting on the organism through external stimuli, which are only disease-causing when the interactions between them and the individual (often already diseased or predisposed) organism produces changes that are different from the health type, and so what you eat and drink, the air, heat, the sensory stimuli, etc. are injurious. How that happens is to be discussed in more detail, in terms of the general pathology. 2) some special agents which are not amongst the natural stimuli causes, and often are very peculiar, specifically change the organism; these are the poisons, miasmas, contagions, and parasites. 2) Malaria disease (disease processes by specific telluric atmospheric miasma generated): Intermittent fever, Yellow fever, Cholera, Pest, Dysentery. 3) Typhus diseases (disease processes by specifisches animales miasma generated): Spotted Fever, Typhus): Ileotyphus (Enteric Fever), Dysentery. b. Catarrh, Influenza, Whooping Cough. 5) Poison animal diseases (disease processes, generated by specific disease poisons of animals): Glanders, Anthrax, Hydrophobia, Vaccinia, Mange (foot-and-mouth disease). 6) Chronic Diseases . . . (Chronic diseases, generated by specific contagions or specifically distinct endemic proportions): Syphilis, Lepra, Trichoma or plica polonica. d) The epi-and entozoa belong here with certain rights. [Those theories] without order, but with the scientific illustration of a doctrine that is not possible or indicative of a systematic process such as Classificationsprincips [Laws of Classification], or satisfying even as an example of a poor alphabetical list, are of limited essential service to science. . . . Science wins not only because it discovers truths, but also because it corrects its errors. d) Dyscrasias with heteroplastic Product formation: Scrophula, Tuberculosis, Rhachitis, Krebsdyskrasie [cancer]. The chief observation for the above taxonomy produced by Canstatt is the mention of “cancer” as the absolute final entry into his nosology–as Krebsdyskrasia. Canstatt relates it mostly to an individual’s susceptibility to developing it. No causes are inferred in reference to the environment. 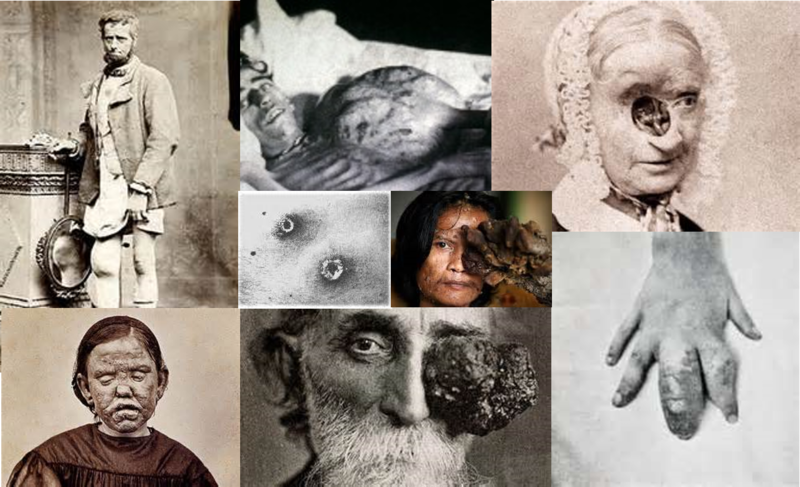 Krebsdyskrasia is of a heteroplastic nature (strange, but multiple forms and content) and defines cancer for what it was–deadly, different in appearance, long lasting and deadly like several other clinically similar diseases such as scrophula, tuberculosis, and rhachitis. Working with a knowledge of today’s concept of cancer, we normally exclude “cancer” from any of the main categories defined above, such as exanthemous, malaria, typhus, atmospheric, poison, animal or chronic, and three of the four types of dyscrasia which focus almost completely on blood. Since the first documentation of cancer or cancrorum in Greek literature, it was mostly associated with connective tissue, not blood. It could be found just beneath the skin, where at times it erupted in full force and exposed itself through the dermal layer, thereby coming in contact with the environment for the first time. Thus this association of cancer with the body, not the environment by Canstatt. All of this would later be changed by the work and teachings of Haviland and others. Canstatt also stated in 1847 that there are other places that cancer can form, and each of the times it follows these routes it takes on a different character. Sometimes it is encapsulated and well delineated at its boundaries, other times it creeps along tissue and through flesh, wedging its way through and between the different body parts. In some cases when it erupts it is out of control, becoming a part every bit and piece of flesh throughout our arms and legs, feet and hands, abdomen, chestwall, lungs, liver, stomach and intestines, and sometimes even brain, mouth and tongue. Other times, it is kept intact as if surrounded by some invisible outer layer. Whatever the case, when we look at a listing of mortalities for this period in history, what we find are relatively few cases of “cancer” in the true and traditional sense. Much of these cases are still recognized mostly due to their presentation in or on the exterior of the body. A cancer of the lungs may be noted as a tumor on autopsy, but during real life is more likely to be considered a form of consumption, still waiting to be converted into some form of blackened flesh due to weakness or environmental exposure. A cancer of the jaw of face could be linked to the goiter so common to malnourished people, or an abscess waiting to erupt, a severe form of some herpetic lesion, or mumps gone awry, or the sister of consumption or phthisis known as scrofula. Your knee’s rapid swelling at 45 years of age, associated with rheumatic fever when you were a kid, is never considered a later onset of the disease or past condition. It is simply considered for what it is, knee arthritis, a consequence of aging combined with long term environmental exposure and conditions. The fact that it is actually due to a much rarer form of cartilage or bone cancer would never be known–you couldn’t tell the difference even if you had to. 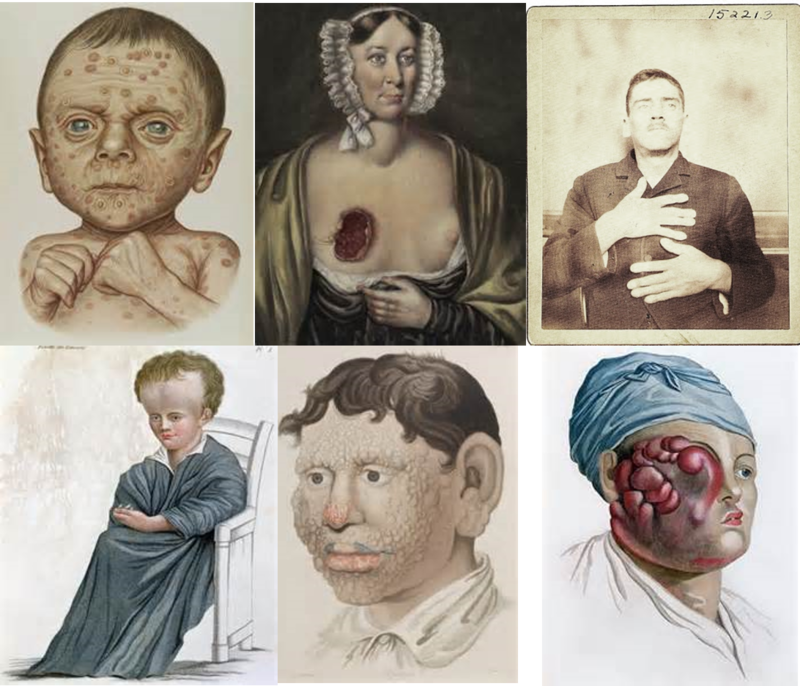 The decomposition of skin and flesh due to scurvy mimicked measles and small pox. The beriberi that resulted in out of control nervousness was considered a consequence of the same illness that was linked to mental derangement resulting from the syphilis you had decades earlier. 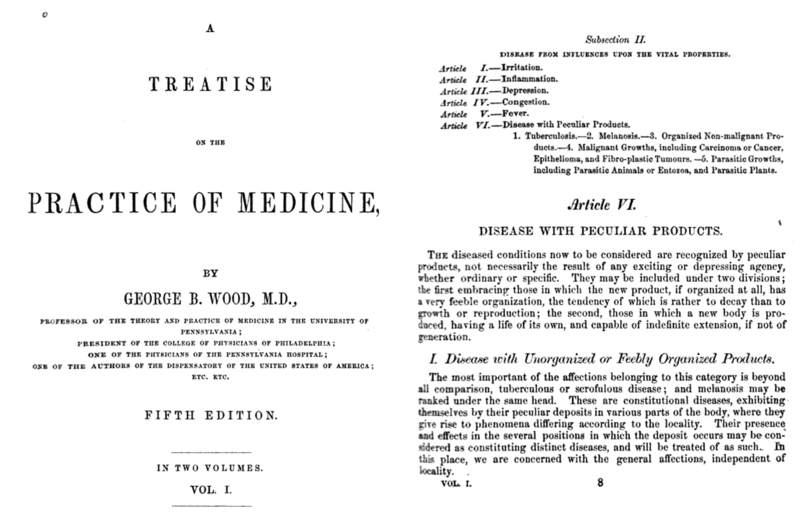 Important to note here is that there were two major points of view of disease by 1850. 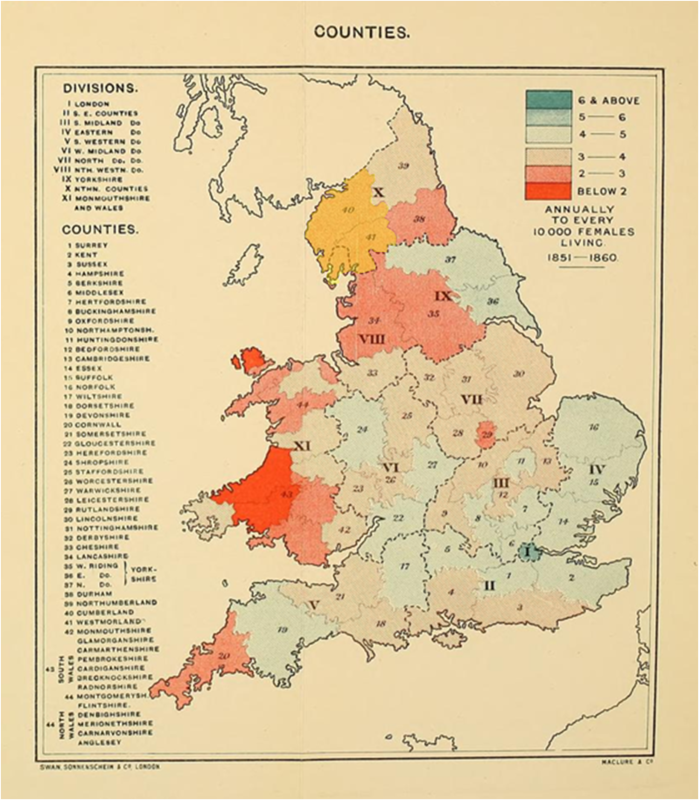 Aside from this geographic take on disease patterns, as summarized by Canstatt, but common to the overall profession, there was William Farr’s zymotic theory becoming popular. 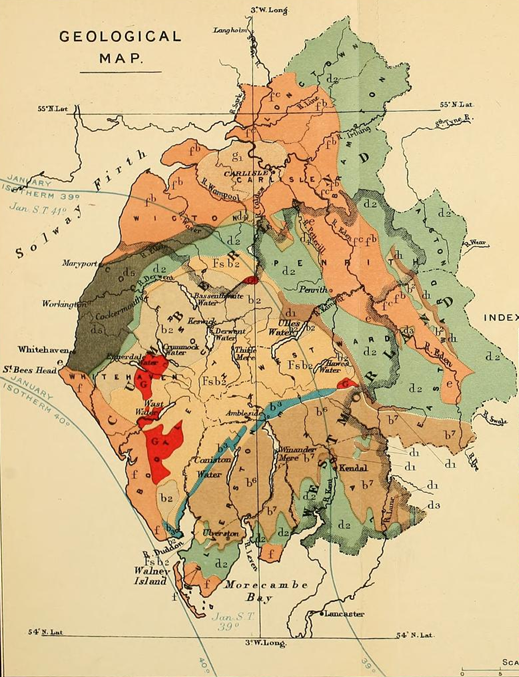 The miasmic theory for disease had its natural history and various offshoots–telluric, hydrologic, and climatic-topographic variations–as did Farr’s theory, which focused on the individual a lot, like Canstatt’s later coverage of internal temperament and inherited physiology as causes. Whatever the case, the blame for disease had two avenues to take in the 1800s–the first blamed the patient and his/her susceptibility, the second blamed Mother Nature. Any physician who was fully read in the literature and who fully understood these attempts to explain disease, would have realized the heterogeneity of cancer cases made it difficult to define a single cause for this condition. Yet, in spite of this common sense, the arguments about a single cause, a unity theory, remained present throughout the remaining century. Some of this confusion Haviland must have experienced when trying to define cancer would have related to the other theories out there for disease at this time. There were the poison, viral, and fungal disease theories, and the animalcule theory, many now being replaced by Farr’s zymotic theory in Haviland’s eyes. What was left to define was cancer. Haviland’s theory effectively merged the miasma of nature, or telluric hypothesis with the geological theory, in such as way as to fill in the blanks for those conditions still in need of explanation such as cancer. Prior to this, diseases like cancer were blamed on fungi, viruses, poisons, the sun, bad water, swamps, certain occupations, exposure to chemicals, dust and dander at home, the coal dust in mines, the ashes of a chimney, the stench of animals on a farm, and even certain town or city like environments. Haviland’s theory got rid of this potential for confusion pretty much, replacing it with another theory that could ultimately gave rise to further confusion–the geologic theory. Besides the internal causes for disease linked to local topography, landforms and geology, there were other physical objects of nature that could still be linked to disease. The impacts on astronomical events on local soil and rock chemistry were possible, induced by the meteors and comets that made their way onto the earth’s surface. For this reason, these abiotic theories for disease were as abundant as there were abiotic objects in nature. This excludes the more energetic forms of activity out there speculated to be the cause for disease, natural processes like magnetism and electric storms, or evidence for the inner heating of the earth resulting in volcanic activity and the spewing of still more toxic gases and vapors. In no way was it going to be easy to demonstrate any single product of nature of being a cause for any disease by way of some single biological process. Applying this to the theory of diseases in general, drawing any final conclusions was a difficult enough process for some doctors. If these theories could be narrowed to a select few pathogies, with just one or a few natural causes, the application of this method of philosophizing could become more credible and revealing. This is exactly what Haviland did by focusing the concept of geological causes for disease on just a specific disease or two, in particular Cancer and Heart Disease. In a more modern sense, the definition of cancer changed a lot by 1900, but still very little was known about it, its cause and its cure. After Farr’s zymotic disease theory can the more mature “germ theory” for disease, which some liked to call that particular part of the zymotic theory that focused on small organisms. 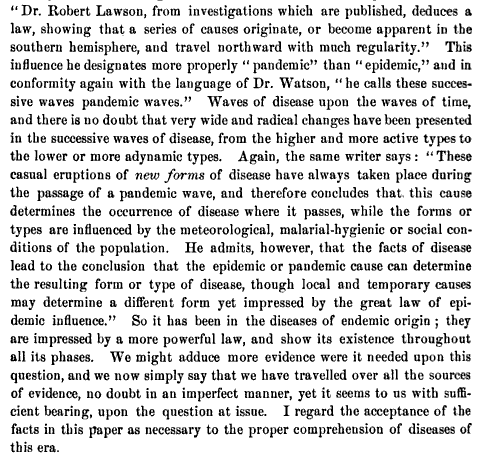 By 1875, the germ theory was written about in the medical journals and contested by those still adhering to the geographical theories for disease. In 1881, even once the bacteria was proven to show a relationship to one disease, followed by others over the next several years, arguments again the germ or bacterial theory continued. Even regular physicians unable to explain the cause for certain diseases such as scurvy, the result of a chemical balance and nutritional deficit in the body, had to revert to that old climate-topographic notion whenever the new theories didn’t work. We see this with the series of maps that Berthold drew up, reviewed elsewhere on this site. 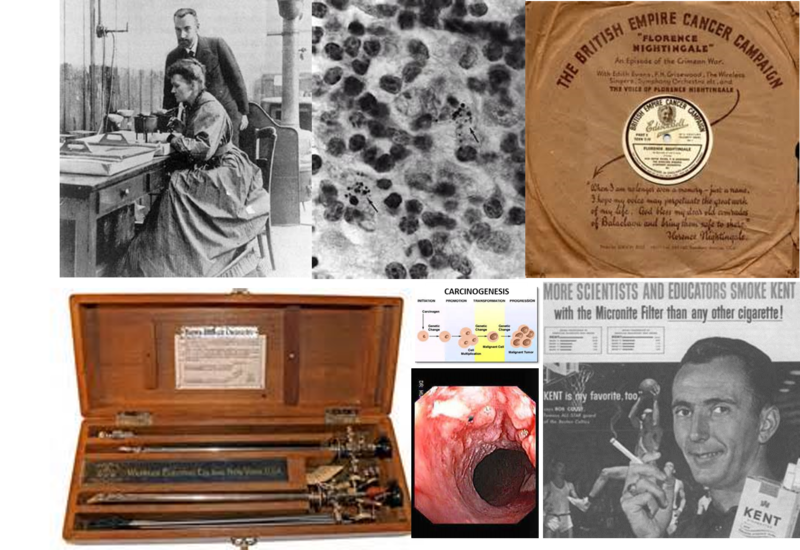 Early to Mid-1900s thoughts on the diagnosis, treatment and causes for cancer. The common belief in the 1860s was that cancer developed due to constitutional causes combined with other environmental factors. If you loosely followed the different renderings of the miasma theory proposed by Canstatt, this meant that you could believe in the formation of tumors as product of viruses, poisons, animalcules, or the result of exposure to cold, wet, rain, swamp gas, too much sun, or it could be due to the miasma generate by natural events like comets passing by, sunspots, meteors landing, and living too close to occasionally active events in nature like earthquakes and volcanoes. You were still uncertain as to direct cause and effect relationships, and had to keep your mind open to many other options. The major disease linking cancer to diseases but later found to be of a biotic nature was consumption or tuberculosis. The microscope had yet to result in confirmation of the mycobacterium responsible for this illness, and so the tissue destruction and mayhem that ensued as a result of such a disease was considered close in cause and effect to cancer. The grainy cereal like, mushy consistency of certain tissues and organ structures resulting from both, as well as their heterogenous appearances by the eye as well as under the lens made the two seem quite similar. This meant that the result of any attempts made to understand tuberculosis could also result in findings that might impact how we interpreted cancer as well. 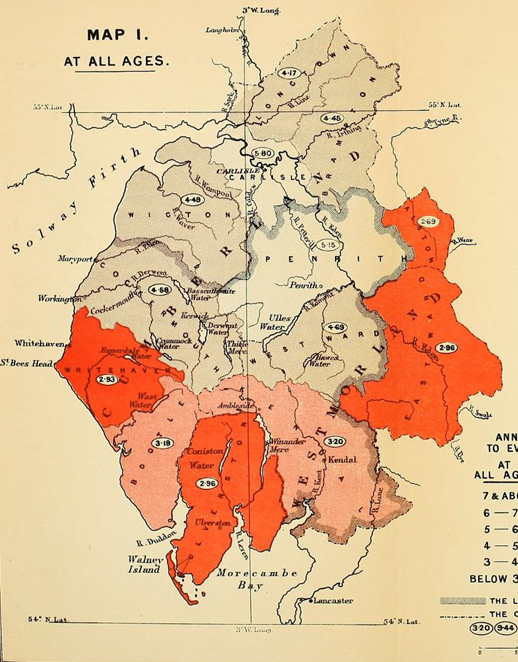 It is therefore no coincidence that Haviland’s way of interpreting the best known cancer for the time, breast cancer, in a way that appears very similar to the other county based way of mapping disease already out there–the mapping of tuberculosis based on soil type in Massachusetts by Henry Bowditch, in 1862. The two represent very similar mindsets in terms of the relationship they believed existed between disease and physical geography. Haviland’s work therefore represents one of several examples of physicians who worked to take some idea about cause to its extreme. 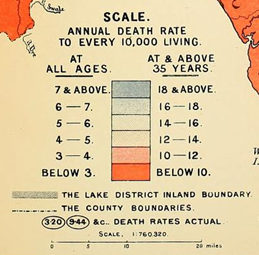 We see this as well in the 1870s with the philosophy of energy-related causes for diseases, demonstrated by Robert Lawson with his map on the effects of the earth’s pole and the solar activities on the surface of the earth, producing different “exposure” risks or “Pandemic Waves” at different combined latitude-climate settings, as illustrated by his famous map. Robert Felkin’s rendering of Climatic and Pandemic Isolines based on the philosophy of Robert Lawson. This common human behavior related to disease philosophy is due to becoming too sure about yourself, believing you have found the final truth in some miraculous way and now can define why a disease becomes effectively untreatable versus curable. During the first half of the 19th century, physicians demonstrating such certainty included Benjamin Rush and his followers in Philadelphia, and Samuel Mitchell and his followers in New York. Haviland’s new way of conceptualizing and determining or redefining the ongoing theories as to the cause for cancer based on its topographical distribution is an example of how we can sometimes believe too much in our philosophy to construct a correct theory as the result of such thinking. We also begin to see the need for further support of these theories or hypotheses with time. A classic example of this is noted for the interpretation of light by two famous scientists. The first views of light depend upon the wave theory, the second the particle theory. Neither is perfect, nor are both wrong. It’s just that neither of these two alone is a perfect theory. The same is true for disease theory and philosophy during this time. Neither Canstatt’s theory, nor Farr’s theory, not Haviland’s theory is perfect. A better theory still needed to be found. R. E. Haughton. On the Changes of Types of Diseases. The American Journal of the Medical Sciences, Volume 52 (Oct. 1866), pp. 389-396. This quote from p. 396. However, there are benefits to knowing Haviland’s theory as a medical geographer. Using modern concepts, we can see how today we might lay the same claim based on Haviland’s maps. If we begin our hypothesis with the observations about the coal-rich region, and associate it with winds brought in from waters to the west, and numbers of older people residing in the region being researched to the east, the temporal-spatial pattern we see suggest to us that exposure to anthracite-dust is what cause the cancer. Based on a more recent to contemporary model for cancer, we might link these cancer cases to the chemistry of anthracenes, the presence of substances known to be estrogenic or estrogen-blocking in nature, the pulmonotoxic effects of the dust, and even other carcinogenic ways in which the sun can influence these agents within the local air, due to topography and windflow. Such is an example of a common tendency for medicine in general–the impacts of Occam’s Razon on medical hypotheses. Whatever the case, there is a spatial relationship in need of exploration, even though its remains difficult to pinpoint an exact cause at the time. 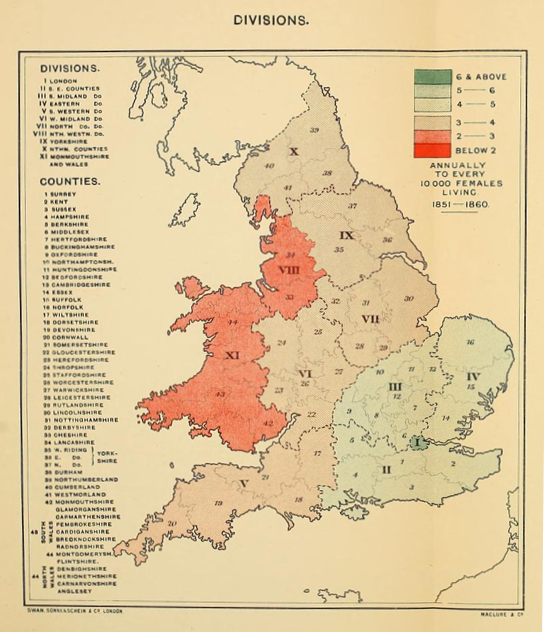 Such is why disease mapping was used, to help clarify old information in new and different ways. The theoretical spatial distributions that Haviland defined with his map also tells us that cancer is not just a result of miasma. If it was, why do the changes exist over township lines and borders? Governmentally defined town/village boundaries remove that appearance of the miasmic and effluvial causes inferred by other mapping techniques. Whereas we see cloud-like interpretations of regions impacted by diseases such as ohe map for miasmatic diseases in 1833 in England or the miasmatic regions of scurvy dispersed over the oceans portrayed by Fernow years later, we don’t see this in Haviland’s work. thus one of the probelsm with historical disease maps is as follows: unknowingly at times we tend to fill in the empty spaces when we envision a relationship of two things in space. This is the case for the way in which Haviland projects his information by regions. This use of political boundaries to define disease distributions is a standard in both past and present disease cartography practices, and is method of breaking a region down into smaller parts that has little advantage other than to make the data presentable. It puts disease into context for us spatially, and for the most part allows us to once again try to make that illustration of figure make sense in terms of what we believe, not necessarily based on anything the map was meant to teach us. The area highlighted on the above map is detailed in the following . . . In the next map, notice the two January isotherm lines, 39 and 40 degrees, a standard in disease maps. Latitude is still displayed. 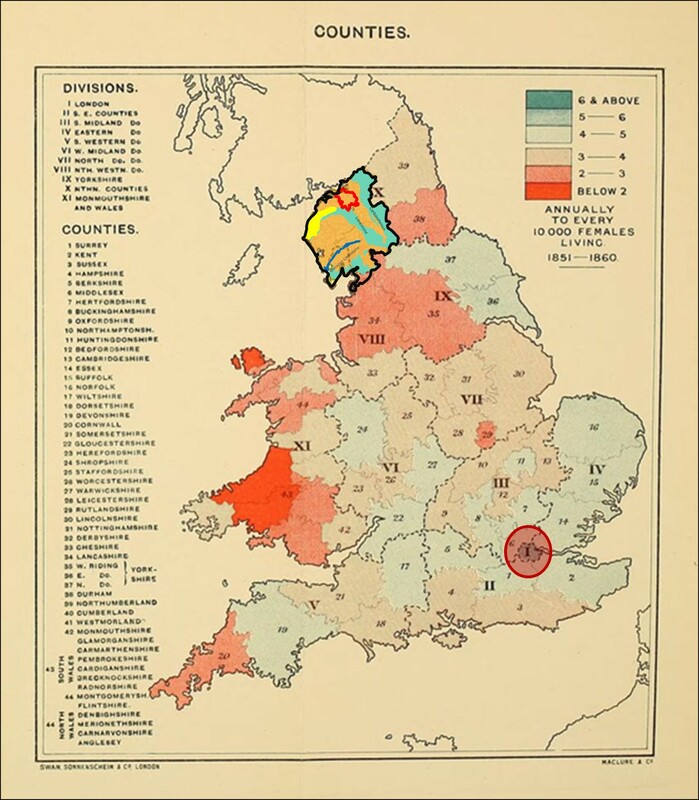 Recalling the traditional theory out there for disease in relation to soil or rock–the notion that diseases are a consequence of, or can be prevented by alkaline substrata–we can apply this to the map of above of Great Britain’s geology. 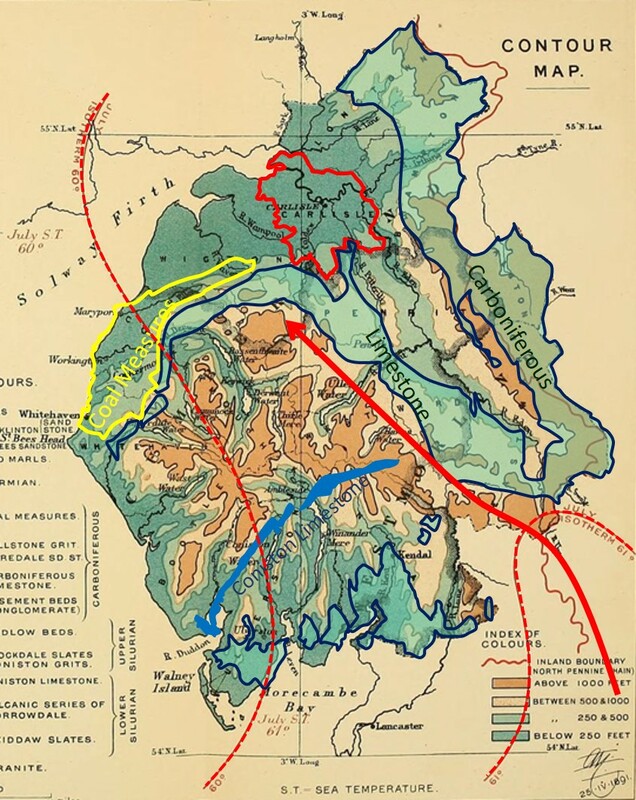 The alkaline material present in the region are Carboniferous Limestone (light blue-grey) and the narrow band of Conistone Limestone (blue-grey). At the western edge of the Carboniferous Limestone is Coal Measures (Coal Bed, dark grey). Much of the remaining substrata are slate, sandstone and conglomerate formations and small sections rich in granite. Of these the least likely to have a chemical impact on the environment are the granite formations. The conglomerate and its similars (all different degrees or salmon tone) tend to have a lesser impact on the immediately surrounding aquifers. In fact, the sandstone and conglomerates may be considered in light of the writing published decades earlier by Midwestern gardener and amateur meteorologist John Lea, who knew enough about geology to come up with the theory that “arenaceous” stone formations such as sandstone and conglomerate might very well be inhibitors of the formation of certain diseases due to their solubility, less alkaline nature and impacts on water quality. The new chemistry that is added to this model of disease geology in relation to Cancer is the chemistry of the coal bed, which by this time in history had two observations on their association with cancer worth noting. First, there is this long lived knowledge relating the occupation of the chimney sweep to testicular and scrotal cancer. This knowledge has been around for more than a century by now, and as fires were changing to coal burning settings, this transition in fact increased the unhealthiness of such as occupation. Second, the knowledge of coal chemistry, in particular its anthracite and anthracene rich nature, was better known. This enabled a link between anthracenic materials and cancer to be drawn, thus strengthening to focus on geology as a cause for cancer (recall the same logic for scrotal cancer in chimney sweeps)). The effects of anthracene compounds on the body are not limited to the outer surface, and so internal cancers might even become associated with this particular form of environmental chemistry. Such features of the anthracene made it the primary suspect for cancer were the observers focused on environmental “poisons” as a cause for cancer. The anthracenes in coal, little understood, were these “poisons” that could be released into the air through burning. Therefore, the common theory that cancer is a consequence of exposure to environmental poisons could develop. 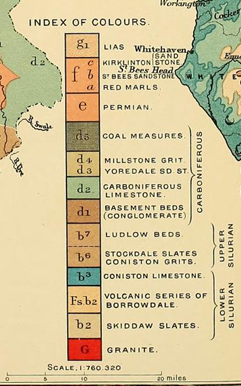 On the map Haviland drew up, notice that immediately northeast of the Coal Bed is Carlisle, a place with two parts to it geologically definable as g1 and fb or Lias and St. Bees Sandstone. This is a low-lying section of the country, indicated as less than 250 feet above sealevel for most of its parts based on the map below depicting elevation features. Notice as well the 60 degree isotherm to its northwest and the 61 degree isotherm to its southeast. This suggests a transition of cold from NW to SE, or vice versa a transition in the colder directions by heading from SE to NW. There is also a suggestion of how temperatures can be related to wind patterns based on this isotherm distribution. In contrast the other isotherm information provided on the map immediately above demonstrates a northeast to southwest line of change, with colder lines to the northeast and warmer to the southwest. This suggest the January wind flow being depicted is capable of producing a wind pattern that when it flows northeasterly crosses the coal bed area and then picks up and carries with it the “poisons” of the anthracene. In theory, this is one of the ways that Carlisle could have become the place with the highest amount of cancer being mapped by Haviland. In the map immediately above, the colors are somewhat deceiving due to the choices. The is a 2-color bimodal depiction with orange indicating the least medical hazard and grey indicating the highest. 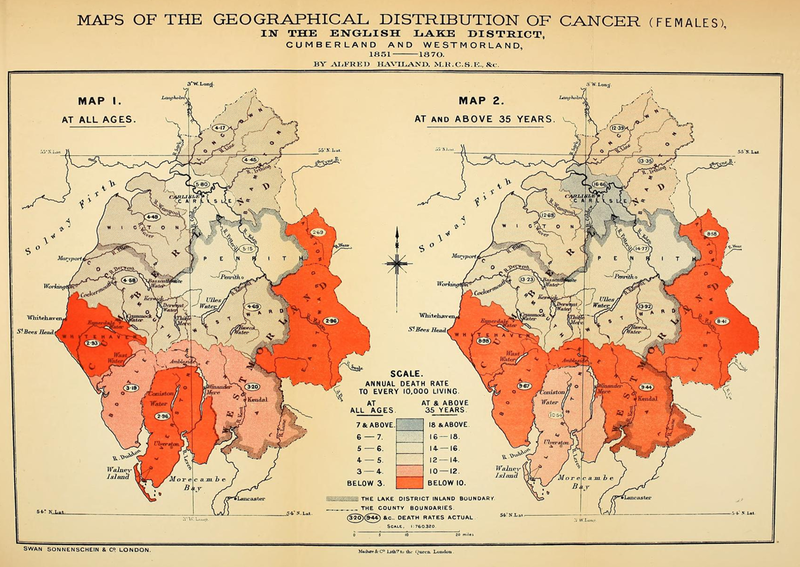 Haviland removed the younger people from his study to produce the second map on the right, meaning it depicts a little more of the relationship that age has in relation to cancer. This changes the focus in a major portion of the south and draws the focus for highest rates into the grey-tones Carlisle region. Enlargements of these two maps appear below. 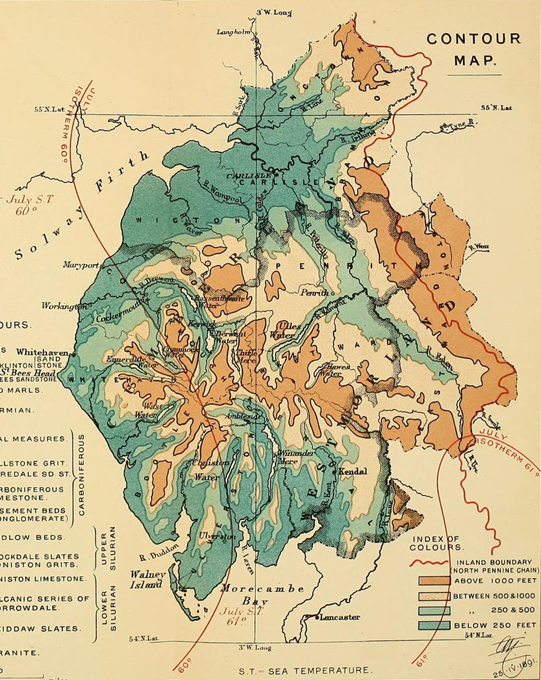 Haviland’s map has two major forms of presentation that he developed for the visual interpretation: topography, illustrated using a contours map, versus geologic substrata–the theoretical rocks and soil distribution. 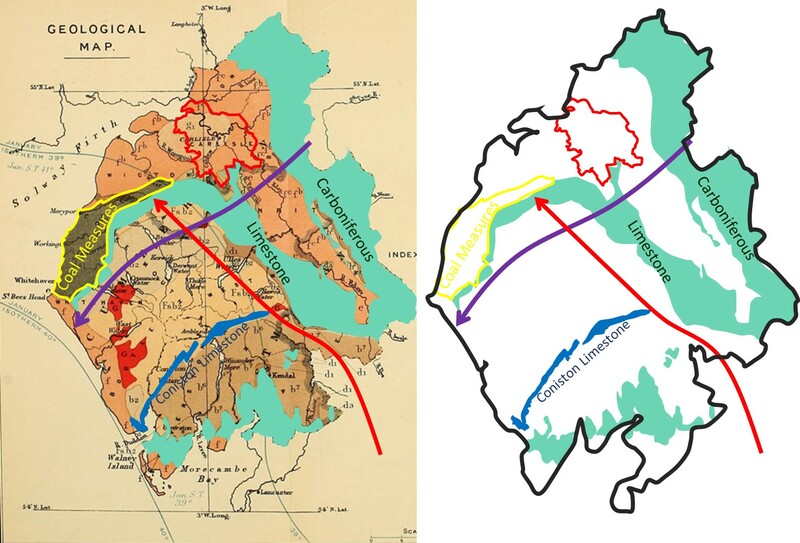 The first is his contour map, which isn’t an isoline map but an isopleth map. So the color pattern utilized is different from elevation maps we are more used to reviewing. The second map, which he entitled “Geologic Map”, is a map of the substrata. 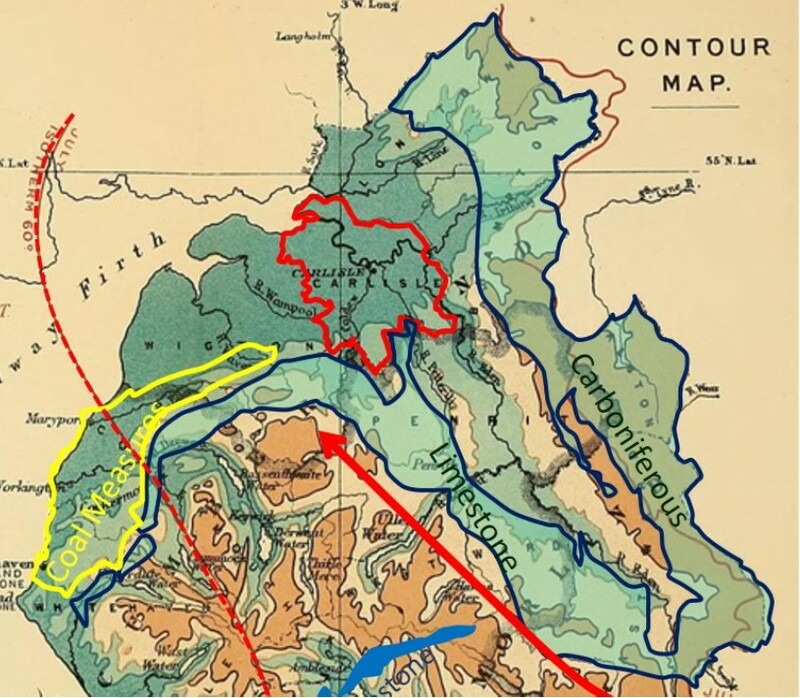 The main geographic features are defined with the first map and which were are displayed by themselves on the right below, are overlain on the Geologic Map that follows for clarification of his theory. Next we can overlay the features of the substrata map onto the contour map to see what Haviland is trying to tell us. Generally speaking, Haviland’s theory doesn’t lack any credibility at all, based on the knowledge for the time. And even today, we still are not certain if parts of Haviland’s theory are true and other false, due to the complexity of carcinogenesis and the impacts of the envrionment on the human gene and human physiology, in other words, human constitution–the same concept taught more than a century ago. This Occam’s Razor effect is prevalent in our studies of cancer and the environment, with spatial interpretations of cancer adding even more to the complexity of such methods of study. True contact and theoretical contact are hard to differentiate from each other. The first is based on the study of the individual developing the disease, which the disease is happening. The second consists of a study or relationships, that are usually most strongly supported using maps. But since maps are often a human conceptualization of our findings, with lines, polygons, colors, etc. depicting a conclusion that is drawn based upon perception, not fine tuned accuracy, those “regions” of highest risk interpreted as ‘facts’ may in fact simply be the end results of theory and a final subjective ‘opinion’, or ‘non-fact’. Other writers of historical medical geography and disease cartography state the same about other very famous epidemiologists who made use of the map to prove their point–John Snow being the most often stated example for this line of logic [need examples to cite], along with the traditional support he often receives. To illustrate to back and forth behaviors that medicine has for disease, geology and mapping, I dare bring up the issue related to John Lea, a regular gardener and amateur meteorologist who proposed the “geologic theory for cholera.” I wrote a review and commentary of this for International Journal of Epidemiology in 2012, published March 2013. 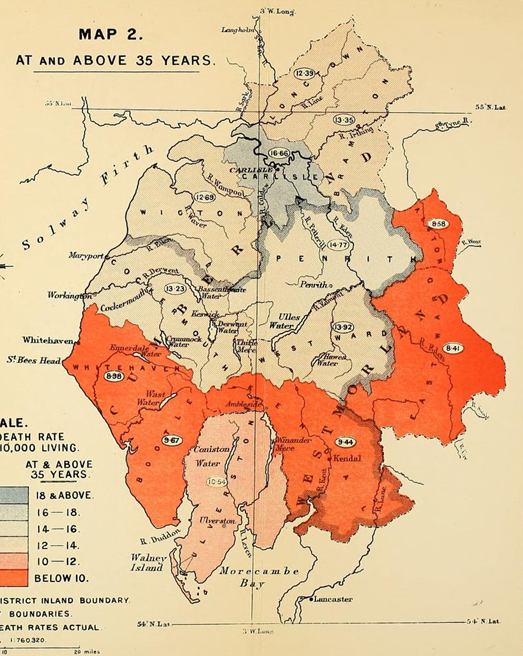 John Lea was correct in his observations about the causes for not suffering cholera–alkaline rockbeds were linked to disease osnet. Yet John Snow and other were so avidly against this theory, in part because it was proposed by a non-MD and by someone’s mixed sets of observations given to prove his points and explain why variations in this natural law existed. But because Snow and others were more willing to accept the ongoing paradigm for the time, the importance of sanitation practices in controlling and modifying health and disease behaviors, they dropped Lea’s geologic theory, but kept William Farr’s topographic-elevation theory, thus implying a reliance still on the topographic causes for disease. Decades later, scientists would learn that alkalinity had much to do with the existence of a pathogen in a given setting, or not. But this relationship was discovered too many years after Lea’s publication for Lea’s work to be remembered, and linked to these new findings. The same is true here for Haviland’s theory for cancer. We can argue that this is different from Lea’s work because it focuses on cancer, not a bacterial disease with very different symptoms like cholera. But such is not totally the case. At the time Haviland produced this article, the theory of a poison or virus being the cause for cancer also prevailed. Poison is not so different from alkalinity in relation to rock structures. The virus is a conceptual object very much akin to the miasma, but of a particular form and with a particular kind if transmission behavior. Haviland uses this theory to also try to explain another mysterious cause for death–heart disease. The chemistry of the environment and its alkalinity as a non-phlogistic or anti-phlogistic concept ( a term then very popular on and off in the 19th C, by writers against phlogiston, or a zymotic explanation for a given disease, but for infectious causes), is what Haviland used to explain why there are more heart attacks in some reasons than others. Nutrition was still a concept decades away from becoming linked to certain diseases. We see this in Felkin’s work of disease mapping, for which scrobutics had yet to be proven to be the result of a nutritional chemical (Vitamin C), and so his map still displays it as a miasmatic concept over seas, but a land-specific miasmic concept in places where it is considered land-born, or “Land scurvy”. Haviland’s map of Cancer had some potential relevancy based upon contemporary theory and findings (anthracene induced cancers, often regardless of the tissue form–Haviland used breast cancer as an example, and anthracenes do behave as estrogenic receptor blockers; see my Benzene Theory for cancer page for more on this). However, Haviland’s map of heart disease just does meet these expectations in the current philosophy for heart disease that is out there. If there was a spatial relationship between place and heart disease, we might expect it to be occupation or income related, in relation to the local occupations for regions during that time, such as mining versus shipping, and upper class versus lower class disease relationships to lifestyle (diet) and occupations.) Thus my reference to the Occam’s Razor effect previously noted, a potential consequence of modern disease mapping techniques and the Big Data electronic medical records [EMR] environment we are now facing. Robley Dunglison. Two editions of the Medical Lexicon.